According to what I can see on his Website, Alba Ecstasy is a whole phenomenon of productivity. I would have thought that Steve Roach was more than very prolific, well it's nothing compared with this synthesist of Romania who is before all a designer of sounds, as show his multiple presets for synthesizers as famous as Korg, Alesis, Virus, Roland and Waldorf to name but a few. With such a pedigree we have to expect a sonic exploration rich in tones and colors. And it's exactly the case, to say the least here! He acquires his first synthesizer in 1996 and did diverse projects before beginning to produce his solo works which can be counted for a total of 56 albums, more or less, since 1999. Only in 2015, he has released the impressive total of 16 albums, the last one being dated of October 27th, which are appeared on his page of download Bandcamp. In 2014? It was 13 albums!? You know me? I show a very big skepticism in front of such a production, such a creativity which equals to a mass-producing industry. On the other hand, I have a good friend who has only great comments for the music of Mihail Adrian Simion, the man behind Alba Ecstasy, who embraces a very great majority of the kinds EM, Berlin School and ambient being at the top of the list. “Before the Big Bang” is the 14th album in 2015 for the Rumanian synth wizard. It's also the first time that my ears taste his universe and I have to admit that I found elements of seduction there, of which this great bonus track. But what holds even more the attention is this imperceptible sensation to hear a new school of EM, the Rumanian School, so much the influences of Indra, who developed over the years a very stylized and personalized approach in the field of EM, are omnipresent in this album which is a fascinating fusion between the Berlin School and the World Music on a background of a rather meditative Electronica. An enveloping synth layer subdivides its perfumes of flutes and of nebulosity which interlace over a bed of quite lively manual percussions, kinds of tribal electronic ones. Sequences invite each other in this astral dance as well as percussions, which this time knock out the delicate introductory atmospheres, in order to nuance the ethereal approach for a kind of Electronica which is slumbering under these delicate layers which breathed the first seconds of "The Pursuit (Intro)". Other sequences crackle in the background, already drawing this fabulous parallel between the music of “Before the Big Bang” and that of Indra and where thin lines of rhythms are mixing the delicacy and the feverishly of the jumping keys to the muffled pulsations of the bass drums. The nervousness of the rhythm and the nuances in its harmonies get lost in the guttural voice of a Tuvan throat chant. A Mongolian tribal additive which will happen here and there, through the five chapters of “Before the Big Bang”. Tears of synth moan at the opening of "Remonstrance". Effects of felted metal percussions flutter all around, trying to seduce these layers which give up their serenity for a structure of rhythm knotted of pulsating jerks and of cooing harmonies. The rhythmic skeleton of “Before the Big Bang” prepares slowly its invasion with silvered elytrons, percussions drummed dully and melodious sequences which unite their diversity into sequenced loops which roll with fine variations in a minimalist road decorated of spiritual ringings and of these hoarse voices which harmonize these strange Tuvan songs. Little by little, "Remonstrance" derives towards the astral space with terrified breezes of flutes and these chants which give a Tibetan depth to a music that we feel more and more theological. Nevertheless the cosmic approach is very present, as in with the title-track and its soft rhythm which is structured on delicate movements of sequences which give the impression of climbing the Mount Imaginary. The ambient movement is rather hypnotic and sound elements, very attractive to the hearing, decorate this fascinating (I like these strange synth pads which sound like sighs of organ) procession where are muttering more and more heavy threatening breaths. I hear Schulze here! We stay in the field of the very ambient with the long introduction of "Voice of Consciousness" where a kind of Tibetan spiritual solemnity loses its meditative mantra to a structure of rhythm knotted, well more or less, in these spasmodic loops of "The Pursuit (Intro)". Structure that we also find, but in a clearly more lively envelope, in "Retrospective (Outro)". Resolutely the most livened up track, and the best to my ears, of “Before the Big Bang” where a swarming bed of sequenced palpitations are decorated with superb and attractive organic tones. A very good track which is very near the Tantric rhythms of Indra. 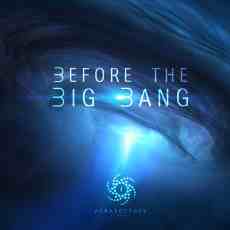 A bonus track, "One Arcsecond" is downright out of the soundscapes all the same rather meditative of “Before the Big Bang”. We are in the purest Klaus Schulze tradition, period New Berlin School, with a lively and nervous minimalist structure of rhythm where the paranoia seems to watch for the last blow of the last sequence and\or percussion. That gives the illusion of a rhythm running constantly after its breath. A rhythm filled up with multiple tones, all rather heterogeneous (Indra style), which clink, resound and fall down with nuances in tones and colors, so thwarting the too numerous traps of a possible redundancy which is often the defect of these long minimalist structures. I liked well this first contact with the music of Alba Ecstasy. Although the fusion of the Mongol chants in structures which marinate between New Berlin School and the Rumanian School (the fans of Indra will know of what I'm speaking here) is not really my cup of tea, I discovered a universe which inhales a source of originality for an artist who seems to have found a niche in a crenel where the proliferation often carries the burden of the wear. A fact that I didn't notice here. Quite the opposite! There is a whole wealth, both in the atmospheres as in the tones and in the effects, which invites me to know a little more about this prolific composer of Rumanian EM.